6th Bedfordshire Regiment, 112nd Brigade, 37th Division, B.E.F. Next of Kin: Son of Eliza Holt, of Westdale, Cradley, Malvern, and the late Philip Holt. Percy was born on 14 January 1896 at Cradley, near Malvern to Philip and Eliza Holt. His father died suddenly in 1907 and Percy went on to be educated at Tewksbury Grammar School between 1910 and 1912. He was a Drapers assistant at Kendall & Co in Great Malvern when he enlisted into the army at Hereford on 6 September 1914. Percy became Private 2210 in the 1st/1st Herefordshire regiment (later renumbered to 235660) and specialised as a Signaller. After initial training he embarked for Gallipoli on the TSS “Euripides”, on 16th July 1915. 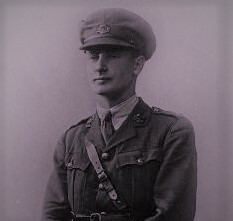 At 7am on 9th August the battalion landed at Suvla Bay, Gallipoli, and Percy survived what can only be called the difficult landings and assaults of that week. Whilst they were in reserve at Karakol Dagh he was admitted to the 26th C.C.S. on Gallipoli with shrapnel in his right foot on the 26th September 1915. He was moved to the 17th General Hospital in Alexandria, arriving there on the 1st October, and on to No.6 Convalescent Hospital 3 days later. By 6th November Percy was back at the Base Depot and returned to Gallipoli for the final phase of the campaign, but was off the Peninsular again on the 4th December. The next year was spent in Egypt and on the 9th April Percy was made up to a Corporal and in September to a Sergeant while his battalion defended the Suez Canal. Sergeant Holt applied for a commission in Egypt on the 30th December 1916 and was shipped back to England for his Officer training on the H.T. “Arcadia”, embarking on the 31st January 1916. He started his training at the 14th Officer Cadet Battalion at Berkhampstead on the 7th April 1917 and was granted a temporary commission in the 6th battalion of the Bedfordshire Regiment September 1917. On the 20th April 1918 Second Lieutenant Holt arrived with the 6th Battalion in the field within a large replacement Officer draft and served with the battalion until they were disbanded in May. His first summer in France was, on the whole, uneventful. The 10th August onwards saw the battalion advancing as a part of the massive allied offensives that would ultimately lead to the end of the war that November. On the 23rd August he was involved in the Hertfordshires’ attack and capture of Achiet-le-Grand, for the cost of almost 200 casualties. On the 27th August he wrote to his mother on German notepaper he must have taken from the battlefield at Achiet-le-Grand. He remarks that he was very well, that he had “been busy as you may have seen in the papers” and how he expects to not be able to write very often after that note. Sadly, this was to be the last letter he wrote as he lost his life a week later. During the Second Battle of Bapaume, the Hertfordshires assaulted German positions north east of Bapaume on the 4th September and suffered badly from machine gun fire and gas. The next day was spent consolidating their new positions under fire but Percy was wounded on the 3rd and died from his wounds at 4.50am on the 6th September 1918, whilst on board the 14th Ambulance Train bound for Rouen. Included in his personal effects were a German pistol and case (perhaps taken at the same time the notebook was), his personal correspondence and ten buttons from his old Bedfordshire Regiment tunic he had kept as souvenirs. He was buried in the St. Sever cemetery in Rouen, where he lies today. After his death his mother entered into what can only be described as heartbroken correspondence with the War Office, desperate to understand more of her obviously much loved one’s death.